4.0 out of 5 based on 40 bloggers and 2 commenters. 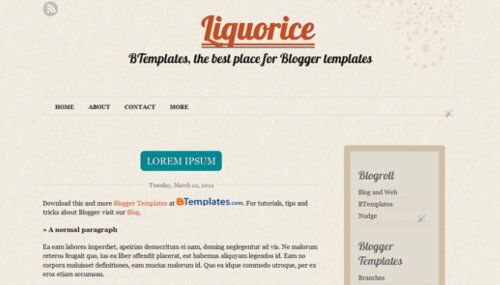 Liquorice is a free blogger template adapted from WordPress with 2 columns, right sidebar, rounded corners, drop down menu, simple look and vintage style. Excellent template for blogs about books or photography. I downloaded and applied the template but I can’t erase the widget “logger templates” by my dashboard,other widgets (labels,blog archive and blogroll)are not displayed. Also,I can’t add more buttons link under the description of the blog bar (I would like to add “about”, “contact” and more,how can I do? ).Can you help me please?I’m a novice pc..